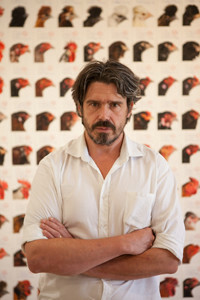 Belgian artist Koen Vanmechelen (b. 1965) believes that art is a vital aspect of society and core to creating vibrant and healthy communities. His wide-ranging creative practice marries exceptional artistry, technological experimentation, and scientific research. 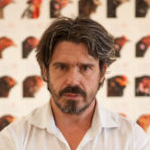 Internationally renowned, Vanmechelen is best known from his ongoing Cosmopolitan Chicken Project (CCP), which he first launched in 1999 to explore cultural and biological diversity. 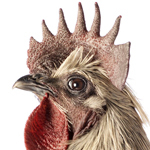 A crossbreeding program—through which the artist breeds chickens from around the world—CCP fosters a dialogue on national identity and the interdependence of different cultures, species, and the environment. 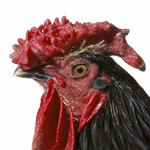 It is little known that the world’s many chicken species are descended from the Red Junglefowl, a bird that lives at the foot of the Himalayas. Humans took this bird and bred it around the world, creating different indigenous breeds that reflect the cultural characteristics of their regions and communities. Over time, though, these breeds risk becoming too isolated, and their gene pools too narrow to remain sustainable. This may lead to some birds becoming entirely infertile. CCP asked a simple question: What would happen if these regional birds were crossbred? 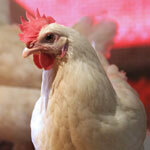 Today, the Cosmopolitan Chicken carries aspects of DNA from 20 different international breeds. With each successive generation, the Cosmopolitan Chicken has become more resilient. It lives longer; is more fertile; is less susceptible to disease; and exhibits less aggressive behaviour. 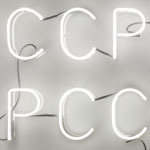 In 2016, Vanmechelen launched the Planetary Community Chicken (PCC) as a response to the positive outcomes of the CCP and as a means of activating his art in the community. The project focuses on bringing new, healthier chickens to the world’s communities, and emphasizes the importance of local, small-scale community farming for long-term sustainability. Modern poultry flocks have become genetically impoverished due to industrial farming practices. PCC couples the genetic information of local chickens with the newest Cosmopolitan Chicken. The introduction of a new ‘global gene’ to the local flocks breaks the cycle of genetic erosion that can result from local inbreeding and industrial mono-cultural production. The desired outcome is to breed a stronger chicken that lives longer, and that, as a result, could offer longer-term economic and social stability to farmers. Through this process, Vanmechelen connects the global aspects of CCP with local heritage and experience, underscoring that to achieve success—both in terms of biologic sustainability and social understanding—the local and the global must work together. 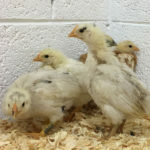 In Detroit, Koen Vanmechelen and Wasserman Projects are partnering with the local, nonprofit Oakland Avenue Urban Farm to bring the latest PCC chicken, a cross between the Hendrix Genetics’ ISA Brown industrial chicken and the 2016 Cosmopolitan Chicken, the Mechelse Wyandotte, into the farm’s farming and sales operations. Other such partnerships are active in Genk (Belgium), Harare (Zimbabwe), Havana (Cuba), and Novosibirsk (Russia). Research suggests that genetic diversification positively impacts health, vitality, and life expectancy. 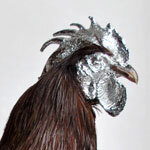 With the Cosmopolitan Chicken Project and now, the Planetary Community Chicken, artist Koen Vanmechelen explores the markers of diversity that make for strong and robust breeds of chickens. 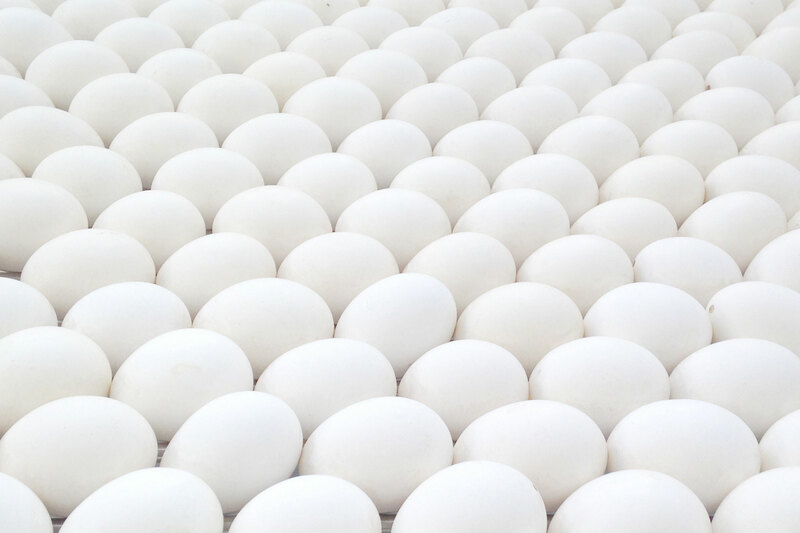 The chicken genome contains more than a billion nucleotides, composed of the four letters of the DNA alphabet, which line up in a specific order. For each of the following chickens – the Mechelse Wyandotte, ISA Brown, and Planetary Community Chicken – the DNA sequence was compared to the scientific standard and genetic diversity was marked when the DNA sequence of each chicken differed. With each successive generation of the Cosmopolitan Chicken, the markers of diversity have increased. 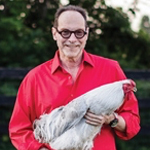 Through 20 years of research for the Cosmopolitan Chicken Project, Vanmechelen has accumulated what is possibly the largest pool of genetic data in one chicken strain. CCP is a lens into human culture. It offers new perspectives on ideas of individuality and globalization. Vanmechelen explores these broader philosophical concepts through his photography, painting, sculpture, and mixed-media installations, questioning the future of our communities and our relationships to the world around us. By bringing together art and science, and considering both past and present, Vanmechelen introduces a remedy against a future cultural and biological bottleneck. The incredible results from CCP have also sparked new explorations into biocultural diversity. In 2018, Vanmechelen will open La Biomista, a natural reserve in his hometown of Genk, which will support the continued study of the relationships between animal, human, and environment. 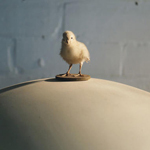 A response that on its surface appears simple, and almost cheeky, offers an essential window into understanding the artistic and philosophical underpinnings of the Belgian artist’s ongoing Cosmopolitan Chicken Project (CCP), the latest phase of which comprises this exhibition. First launched in 1999, CCP crossbreeds chickens from around the world as a study into the impact and significance of cultural and biological diversification. For ENERGY/MASS, the 19th generation Cosmopolitan Chicken, the Mechelse Cemani, is bred with the Detroit referred Wyandotte, to create the 20th generation Mechelse Wyandotte, which now holds aspects of DNA from 20 different breeds from across five continents. 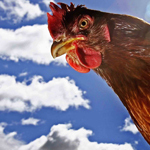 With every successive generation, the Cosmopolitan Chicken has become more resilient. It lives longer, has increased fertility, combats illness more effectively, and shows less aggressive behavior towards other breeds and animal species. For Vanmechelen, this process has inspired a broader questioning and exploration of the parallels with our own human culture. 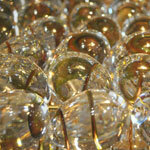 Ideas that he further explores in his photography, sculpture, and mixed-media installations. These works, in conjunction with the growing flock of Cosmopolitan Chickens, which are living artworks in their own right, offer new perspectives on ideas of identity, individuality, and the interconnectedness of all living beings to each other and the environment. While humans have come to believe that they are the orchestrators of the living world, the truth is that we are but one part of a fragile ecosystem, connected by energy and mass, and necessary to each other’s survival and that of the planet. 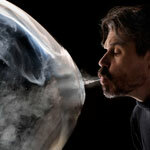 The Belgian artist Koen Vanmechelen (1965) is an internationally renowned, conceptual artist. His groundbreaking work deals with biocultural diversity and identity. Over the past decade Vanmechelen has collaborated with scientists from different disciplines. That earned him an honorary doctorate at the University of Hasselt in 2010 and the Golden Nica Hybrid Art in 2013. Netherlands, Mexico, Thailand, Brasil, Turkey, Cuba, Italy, Russia, China, Egypt, Senegal, Slovenia and Austria. ‘Combat’. In 2011 their supporting foundations were grouped into a new institute entitled the ‘Open University of Diversity’. of Venice, his work has been shown at the Biennials of Moscow, Dakar, Poznan and Manifesta 9, at the World Expo Shanghai 2010, the Triennial of Guangzhou, and at dOCUMENTA (13). Vanmechelen lives in Meeuwen-Gruitrode, in the northeast of Belgium. He is an honorary citizen of his native town of Sint-Truiden. In 2011, he based his studio and headquarters in Hasselt. Koen Vanmechelen and his team are currently working on the development of his new studio ‘La Biomista’ in the former zoo of Zwartberg, Genk.